Life is so weird. Yesterday it was 65 degrees and cloudy, so I went on a long run, fertilized the yards and admired our BLOOMING (??!) daffodils and crocuses. It poured poured poured rain over night, so I awoke to a slightly greener yard, a pale yellow glow from our forsythia and horrible bed head. This morning we’re expecting SNOW and more rain, so I’ll crawl back into bed, perfect the art of twiddling my thumbs and set my hair on fire. This afternoon it’s supposed to be full sun and temperatures reaching the 70s by the end of the weekend, so I’ll emerge from my bed cave, sing praises to all the land and go buy a wig. All this weather and wig riff raff calls for a cupcake. OHHHHHHH but not that kind, tootsie cheelah bear! Don’t look so surprised. You know me. I LOVE THE SALT. 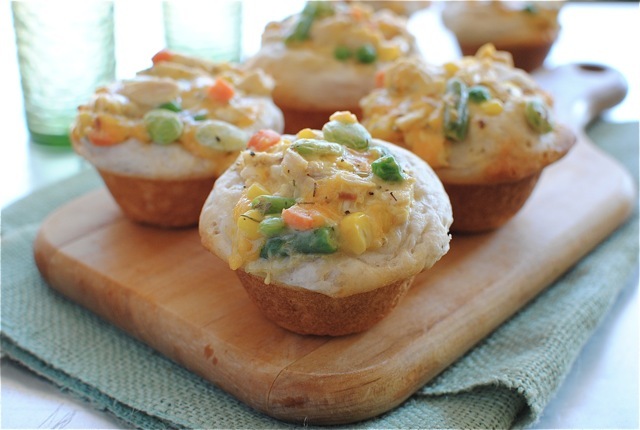 Chicken Pot Pie Cupcakes. Ain’t kidding. Here’s the recipe and full story on these CHICKEN POT PIE CUPCAKES. I still can’t even get over them. Say “wig riff raff” 5 times fast. Okay here’s a distraction in case you’re in the mood to drop kick me for not showing you a real cupcake. Meeexican Paaaasta Baaaaake. You guys, there’s chicken in it, cream of mushroom sewp, CORN, red bell pepper, Mexican SPAHCES and bow-tah pawsta! I just got back from Arkansas and the accent is lingering to the point that I’m afraid of seeing divorce papers on the table. There’s also room for your entire HEAD in this delicious pasta casserole bake thingy. You should get in it, stat. Here’s that recipe and story for your eyeballs to read! Cupcakes - - genius, I could down a couple if given the chance. 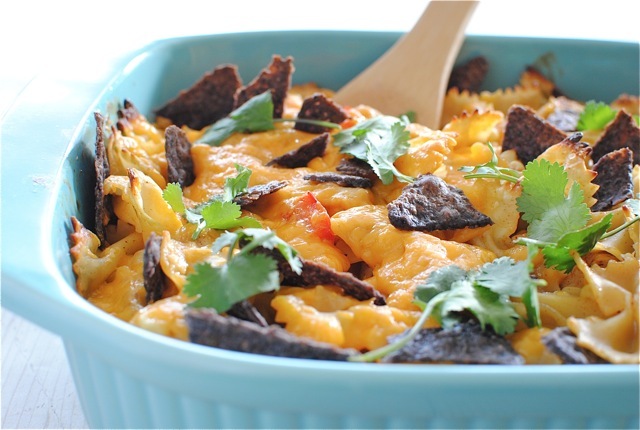 Mexican Pasta bake - - mind if I jump in and live forever?!?! Holy mother of yumminess! Why is Mexican food so good?! Your pasta bake is calling to me! The weather is definitely interesting. These cupcakes are the cutest ever! Those cupcakes are too fun! Definitely still friends. Although your tastebuds are nutzo. And I'm kind of jealous that they don't demand that you hoover cake 24 hours a day. Two amazing dishes? You're spoiling us! Chicken pot pie cupcakes... this is as unbelievable as your crazy weather. I want to eat 4 of these for lunch on a snowy day, then run it off in 70 degree weather a couple hours later. These are made of happiness. This cupcake is made of CHICKEN POT PIE for goodness sakes. Heck yes. Can I just swim in it? Looks amazing! omg these are so creative! You're genius! These are super creative and adorable! The mexican pasta bake sounds SOOO delish!! Fiesta time! Both look awesome. What about a mexican chicken pot pie!?!? Ohhhhh chicken pot pit cupcakes, I love it. (And I agree with Erin above me...I would love a Mexican pasta-stuffed cupcake as well). I would love to try this recipe and take it just one step further to make the "pot pie" out of cornmeal for a nice little cornbread texture and flavor. Always a fan, Bev...nice work! Oh Mexican Food Happiness, How I love thee! Ok Bev, this is so unusually amazing!! I love this concept!! Those pie cupcakes look amazing! Such a cool idea! I want to dip these chicken pot pie cupcakes into a larger chicken pot pie. Wow, that makes me sound like a glutton... but seriously. These look amazing! Pot Pie Cupcakes? Seriously, woman? seriously? That's effin' genius! I'll take 5. Um, yeah. BETTER friends than before! No apologies necessary! I kind of prefer these to real cupcakes! Wow! Both of these look so fantastic, I can't decide which one looks better. Great idea for single-serving chicken pot pie. Also, Mexican foods are among our favourites! My daughter is big chicken pot pie fan, so I had to try these and see if they were as good as they look. We were hooked. Now, when I make a reular pot pie, she asks for me to use any leftover filling to make these for her school lunch. I have had many moms ask for the recipe, lunch box envy! I like the flavor the herbs de provence give the cupcakes.